“Blues is the roots, everything else is the fruits.” So said one of the most prolific Blues songwriter, Willie Dixon. 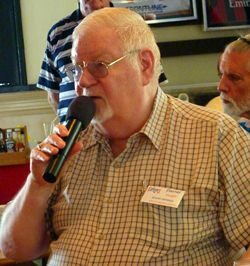 This along with other interesting facts about blues music was learned by members and guests at the Pattaya City Expats Club meeting on July 13. The group Slow Ride spoke about the Blues in between performing some Blues songs. The group consists of Tony (Tone) Stevens on Bass, Ken (Snowman) Minahan on Guitar, and Somchai (Oi) Sihaapai on drums. They are presently featured at Pattaya’s MOOD Café and Night Club at Thepthip Mansion Condo on Pratamnak Soi 6. Ken explained that Blues originated in the days of slavery and evolved differently in the various countries where the slave trade was practiced. In the U.S., he said, Blues is the root of all American music. Wikipedia explains that the Blues originated in African-American communities in the U.S. “Deep South” from spiritual work songs, field hollers, shouts and chants, and rhymed simple narrative ballads. In the U.S., the slaves were not allowed to use drums in their music because their masters believed that the slaves would use the drums to communicate with other slaves in neighbouring plantations. Consequently, the slaves used song to relay messages from field to field; whereas their masters thought they were simply singing to pass the time in the tedium of work. 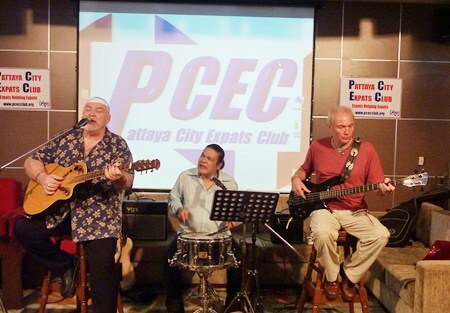 Slow Ride entertains the PCEC with several Blues tunes with Ken (Snowman) Minahan on Guitar, Somchai (Oi) Sihaapai on drums and Tony (Tone) Stevens on Bass. Hand clapping and voice were the earliest instruments. Other early instruments were the harmonica, the banjo and the diddley-bow. The last consisted of a single string of baling wire tensioned between two nails on a board over a glass bottle. 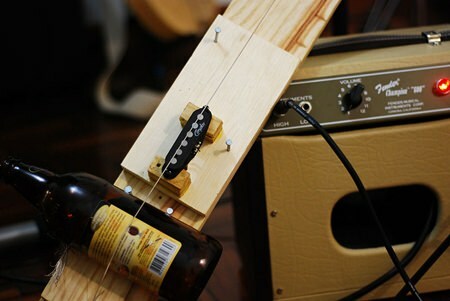 The bottle is used both as a bridge and as a means to magnify the instrument’s sound. Sometimes a rock was also added. Ken mentioned that this was the source for the American singer Bo Diddley’s stage name. 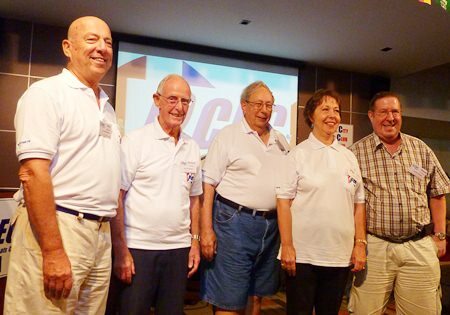 The PCEC introduces their officers for the coming fiscal year: (l to r) Roy Albiston, Chairman, Richard Smith, Vice Chairman, Wilson Fletcher, Sergeant-at-arms, Judith Edmonds, Treasurer, and David Garmaise, Secretary. Member Darrel Vaught during the Open Forum gives PCEC members and guests the latest updates on Thai Immigration matters. The Blues encompass a broad spectrum of music; within the U.S., there are regional variations. Ken said that the Christian religion was forced on the slaves and that, when combined with their Blues traditions, this led to gospel and soul music. Slow Ride played several Willie Dixon songs. Dixon was born in 1915 and died in 1992. There are many Willie Dixon songs available on YouTube. The group also played a Sam Cooke song called “A Change is Gonna Come.” Slow Ride concluded their mini-concert with a rendition of “The Blues is All Right” that included some audience participation. Visit You Tube at http://www.youtube.com/watch?v=dGpZQ60tvDk for a sample of their music. Master of Ceremonies Richard Silverberg brought everyone up to date on upcoming events and called on Roy Albiston to conduct the always informative Open Forum where questions are asked and answered about expat living in Thailand, especially Pattaya.